Diagrams, organizational charts, flowcharts, even floor plans - they're all types of business graphics. Only one tool does 'em all: SmartDraw. Diagrams, organizational charts, flowcharts, even floor plans - they're all types of business graphics. Only one tool does 'em all: SmartDraw. SmartDraw For Dummies shows you how this business graphics software helps you make boring presentations exciting and how to create graphics that can help you sell, manage, inform, motivate, and more. You'll learn how to set up the program, navigate its somewhat unique interface, and work with SmartDraw's thousands of templates. You don't need artistic talent, just this handy guide and the extended, fully functional trial version of SmartDraw that's on the bonus CD! * Use SmartDraw templates to create org charts, flowcharts, express charts, mind maps, Live Maps, and more* Dress up your graphics with color, effects, and design themes* Learn to integrate your graphics into Microsoft Office applications and animate graphics for cool PowerPoint presentations* Explore SmartDraw diagrams for Web pages and e-mail newsletters* Import SmartDraw graphics into Word and Excel documents* Take advantage of extra software and additional templates, sample drawings and flowcharts, image editing tools, maps, and flyers on the CD You'll also find graphics guidelines to help you create more effective charts and presentations, plus tips on using color and images to your advantage. 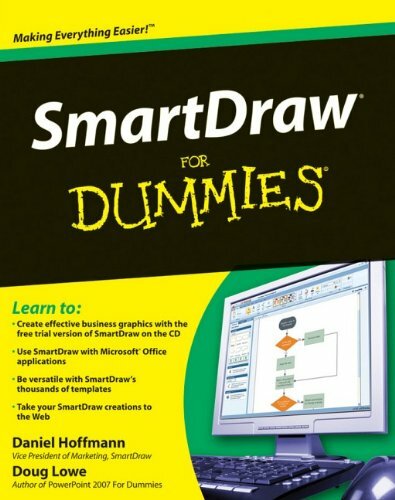 Written by a Microsoft PowerPoint MVP and a SmartDraw vice president, SmartDraw For Dummies helps you banish boring charts forever! Note: CD-ROM/DVD and other supplementary materials are not included as part of eBook file.